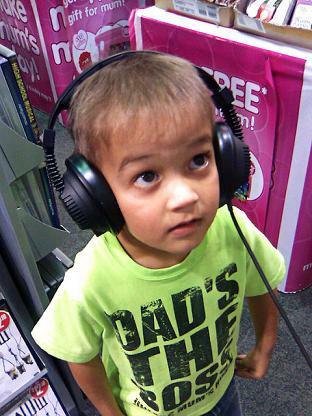 The boy is listening to the music. He is listening to the music. Студе́нты слу́шают ле́кцию по исто́рии. The students are listening to a lecture on history. Sergei was listening to me carefully. He won't listen to anybody's advice. literal He doesn't listen to anybody. Слу́шай, мо́жет, схо́дим в кино́? literal Listen, maybe we'll go to the cinema? В э́том семе́стре мы бу́дем слу́шать курс вы́сшей матема́тики. We'll be attending a course in higher mathematics this semester. literal In this semester we will be listening to a course of higher mathematics. Де́ти не всегда́ слу́шают, что им говоря́т. Children don't always pay attention to what they are told. literal Children not always listen to what they are told. В э́том зда́нии слу́шали де́ло об уби́йстве. There was a hearing of a murder case in this building. literal In this building, they heard a murder case. The doctor examines a patient with a stethoscope. literal Listen more, speak less. The imperfective verb слушать is not used in the Future Simple Tense. Use the perfective verb послушать instead.